Cotton Mesh Trucker Cap with front embroidered logo. Add embroidered number to back for $7.00. 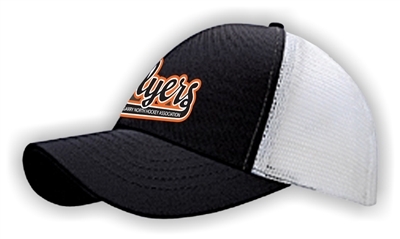 Firm buckram 6-panel modified pro-style cap. Nylon mesh side and back panels with matching colour plastic adjustable back strap. Matching colour underpeak, sweatband, inner taping and two sewn eyelets. Cotton Mesh Trucker Cap with front embroidered logo. Available in Black/White. One size fits most / adjustable. Add embroidered number to back for $7.00.